Eusebius Hieronymus Sophronius, more commonly called Jerome, the Anglicized from of Hieronymus, died September 30, 420. Marking the day of his birth into glory, the Church commemorates this great saint on this day. Jerome was born in the little village of Stridon, on the Adriatic Sea, around 345 AD. Jerome came from a moderately well-off Christian family. He was tutored at home until about the age of twelve, when he went to study in Rome. He was an outstanding student, and he acquired a considerable reputation. His moral life was far from blameless, but he remained close to Christianity, and at the close of his studies at the age of nineteen, he was baptized. After extensive travels, he chose the life of a monk and spent five years in the Syrian Desert. There he learned Hebrew, the language of the Old Testament. After ordination into the priesthood at Antioch (against his wishes) visits to Rome and Constantinople, and attendance at the Second Ecumenical Council (381), Jerome settled in Bethlehem. 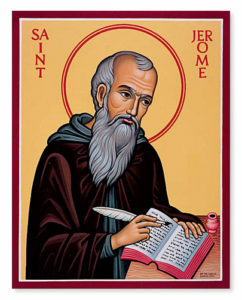 Collect for the Commemoration of Jerome, Translator of Holy Scripture: O Lord, God of truth, Your Word is a lamp to our feet and a light on our path. You gave Your servant Jerome delight in his study of Holy Scripture. May those who continue to read, mark, and inwardly digest Your Word find in it the food of salvation and the fountain of life; through Jesus Christ, our Lord, who lives and reigns with You and the Holy Spirit, one God, now and forever. Amen.